The 30 most senior leaders of a leading healthcare organization articulated their long-term vision, developed the bold moves they would make to achieve that vision, and envisioned a movement to transform the industry. The next step? Building belief in that vision with the next 350+ leaders in the organization. To achieve this, my team designed a day-long leadership summit in which the senior leaders shared the vision and bold moves, then invited attendees to engage with it. We designed the entire leadership summit, equipping the senior leaders to facilitate conversations and designing experiences and a workshop to bring the vision to life and help attendees to lead the movement through storytelling. A leading apparel manufacturer came with a simple ask: transform our company’s rising stars into effective leaders. We created a 5-month leadership development program and piloted the program with 40+ designers emerging into leadership positions. 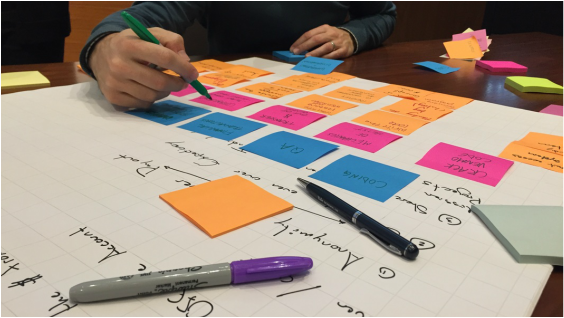 I helped design and develop the marquee 3-day workshop experience and coached our client team to facilitate it. We developed a framework showing how teams succeed in the organization, designed a workbook and suite of materials to help leaders during and after the workshop, and created a digital tool to help assess the performance of their teams as they transformed from world-class designers to world-class leaders. A successful education nonprofit organization that had recently raised $120 million asked us to help them use this funding to expand their impact outside of education. Through interviews and workshops with the senior leadership team, we helped articulate their core offering, ideate ways in which this offering could be applied to new industries, and prototype potential new offerings that could further their mission. We then led two workshops to help their leadership team, donors, and collaborators bring the new organizational vision to life, build belief in it, and play a role in shaping it. ​Projeto CIES was at a crossroads. The mobile health clinic was growing rapidly, which was good for business but bad for the quality of service provided to Sao Paolo’s poor. Through over 30 interviews with everyone from the cleaning staff to the CEO, a key insight emerged: the most successful employees at CIES were those who found their work to be deeply meaningful. Armed with this key insight, my team developed a suite of tools to help CIES implement values-based hiring and management to find and retain joyful employees who delight patients. Though its platform provided a superior patient experience and reduced patient readmission rates by more than 50%, Health Recovery Solutions had to offer discounts time and time again to complete sales. After interviewing salespeople and potential customers, my team discovered vastly different incentives underlying decisionmakers at hospitals and home health agencies. We redesigned Health Recovery Solutions’s contract to better speak the language of their potential customers. As a leader of the Design + Innovation Club at the Yale School of Management - one of the largest and fastest-growing clubs on campus - I teach our 300+ members about design thinking and how to use it in their careers. I helped organize the 2015 MBA Innovation Summit with students from Columbia and Wharton, launched a new club website, and brought a diverse lineup of guest speakers to Yale to discuss design and innovation in their fields. ​In two years at NORC, I identified a common pain point: paper data collection was slow and error-prone. It is difficult to successfully integrate technology into work in the developing world but, over three years, I worked tirelessly developing and iterating new workflows to make tablets work, ultimately reducing the data collection-to-analysis delay by 67%. This included managing Senegalese engineers in the development of a custom-built platform to collect data from 14,000 households in 15 Kenyan cities for the World Bank. The International Finance Corporation wanted to help commercial banks better serve small and medium enterprises (SMEs). By combining desk research with 52 mystery shopper visits and interviews with 23 banks and 600 SMEs, I found that banks’ claims of offering sufficient products to SME owners weren’t backed up by the SME owners themselves. The IFC distributed the resulting report to banks to promote lending, and I co-authored two articles in the International Journal of Economics and Finance.